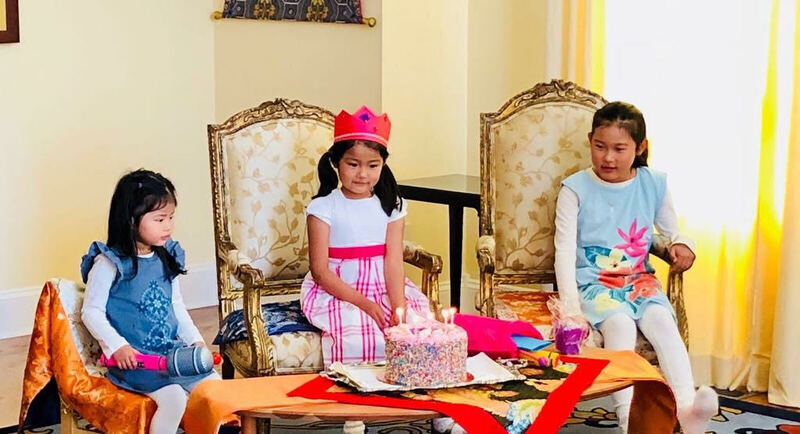 On Saturday, March 17th, Princess Jetsun Yudra Lhamo Yangchen Ziji Mukpo, her family, and many friends celebrated her 5th birthday at the Kalapa Court. The themes for the party were unicorns, rainbows, and pink. On a beautiful sunny spring afternoon, as the children entered the Court, they were greeted by a magnificent flower arrangement in pinks and purples, large exploding hot pink paper flowers and streamers, and a huge standing unicorn balloon the size of a small pony. Already they were in a land of enchantment. 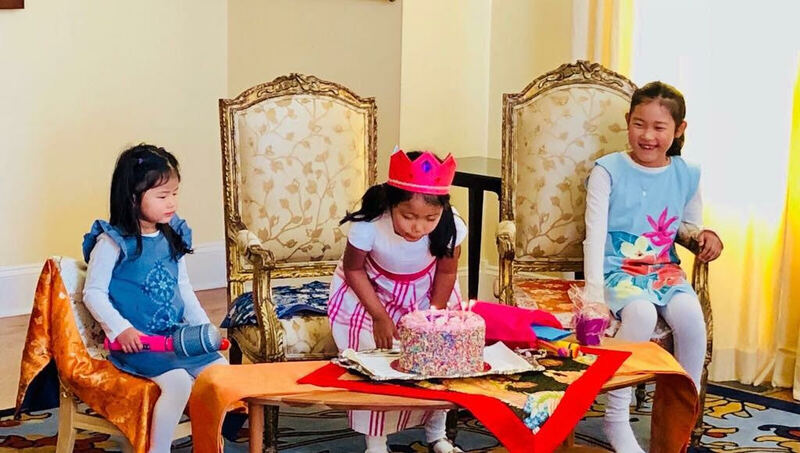 The children first gathered in the play room, where they baked imaginary treats, read to themselves and each other on giant stuffed bears, played drums and other instruments, and relaxed with their parents. Next, all the guests assembled in the dining room, where they were joined by the Sakyong and Sakyong Wangmo. They were treated to delicious snacks made in the Court kitchen. 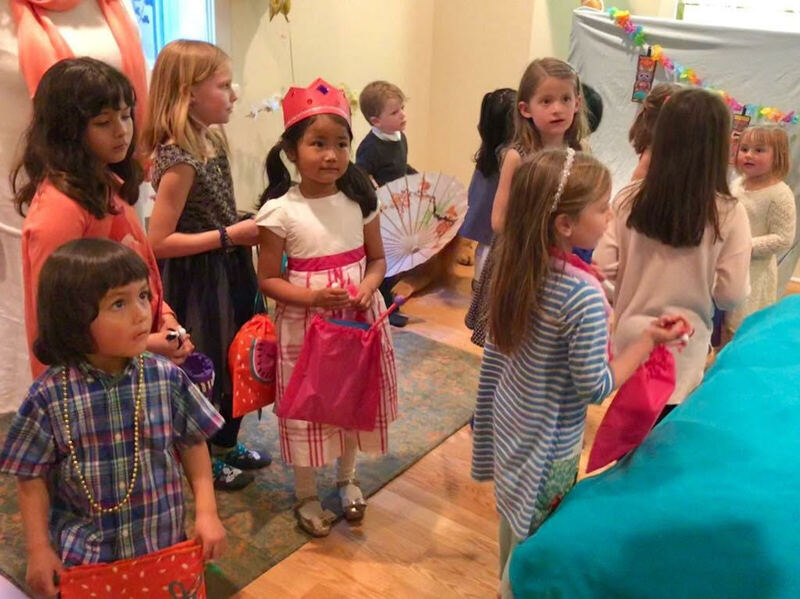 Following the refreshments, the children received embroidered bags to carry along while Steve Sachs and Norah Murray led them on a journey through many lands. The Sakyong and Sakyong Wangmo traveled along with them to each one. Steve announced each land by reading a colorful, decorated proclamation with a clue to its location. In each delightfully decorated room, the children found a gift to put in their pouches. In the Land of Snow, they received a crystal wand and stickers. In the Land of Tropical Islands, decorated with large palm tree and sun balloons, tropical instruments, and more, they received toy leis. In the Land of Rainbows, in which hung a rainbow quilt and rainbow streamers, they received rainbow-colored Slinkys. And in the Land of Sing (a movie favorite), they received maracas and blow-up microphones. In the final destination — the Land of Shambhala — where the Sakyong, Sakyong Wangmo, and the Jetsunmas were seated, everyone sang Happy Birthday to Jetsun Yudra as a unicorn-decorated cake was presented. 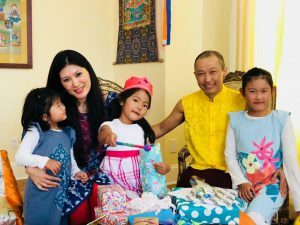 The Sakyong Wangmo gave the children beautifully wrapped little planters with a seeded heart that sprouts when planted. How magical! After cake, Steve summoned the group with sweet sounds from his lap dulcimer. He and Norah led songs, the Hokey-Pokey dance, We are the Warriors, and the Shambhala Anthem, with the young ones dancing and spinning and giggling throughout. Finally, each child personally presented their gift to Jetsun Yudra. With high spirits, much lungta and delight, and surrounded by love, the families departed into the late afternoon light, and Jetsun Yudra shared the evening with her family. Margery Lynch serves as Boulder Secretary to the Jetsunmas. Thanks for giving us a window into this delightful occasion and event, Margery!